In the past, the inequality and civil strife that prevailed among the many ethnic and cultural groups in America was considered acceptable, or at least legal. In the past, the inequality and civil strife that prevailed among the many ethnic and cultural groups in America was considered acceptable, or at least legal. 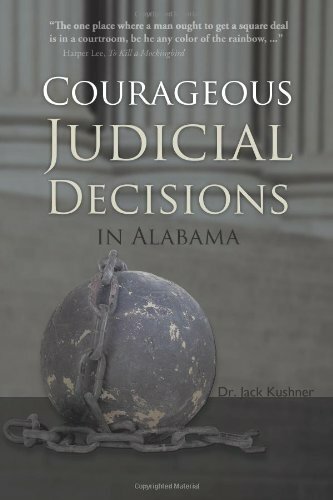 Dr. Jack Kushner honors four men who stood against this and made sacrifices despite the consequences in his book, Courageous Judicial Decisions in Alabama. Based on a thorough review of court cases preserved at the Alabama Supreme Court Library, Dr. Jack Kushner identifies four judges: George Stone, Thomas G. Jones, James E. Horton Jr., and Frank M. Johnson as the men who have made decisions in court that led Alabama to the right direction. To see the history of the state of Alabama recorded in the courtroom, reading the decisions of these four judges is encouraged. To appreciate their courage, descriptions of the surrounding circumstances when they gave their judicial decisions are given. Moreover, details on influential theories on judicial behavior are clarified. Book copies are available at Amazon, Barnes and Noble, and other online book retailers. Dr. Jack Kushner is the son of Louis Harry Kushner and Rose Feldman Kushner; they moved to Alabama in 1937. Growing up in Montgomery, Alabama, he witnessed how Alabama became a state. He graduated from Tulane University and went to University of Alabama in Birmingham.